Wherefore the Lord said, Forasmuch as this people draw near me with their mouth, and with their lips do honour me, but have removed their heart far from me, and their fear toward me is taught by the precept of men. (Isaiah 29:13). Ye hypocrites, well did Esaias prophesy of you, saying, This people draweth nigh unto me with their mouth, and honoureth me with their lips; but their heart is far from me. But in vain they do worship me, teaching for doctrines the commandments of men (Matthew 15:7-9). 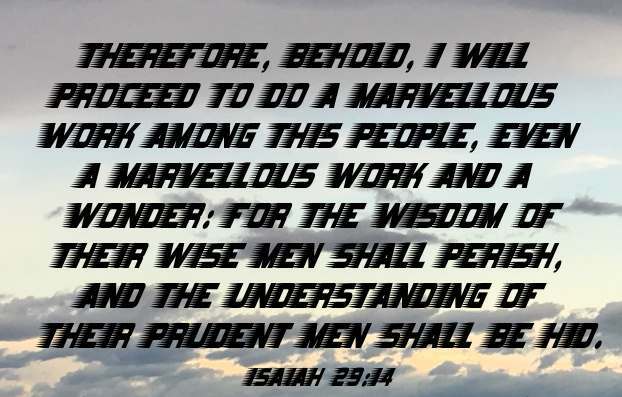 Therefore, behold, I will proceed to do a marvellous work among this people, even a marvellous work and a wonder: for the wisdom of their wise men shall perish, and the understanding of their prudent men shall be hid (Isaiah 29:14). People in Isaiah's time thought they could hide from God, that He didn't know "what's going on", "that He didn't see them" (Isaiah 29:15-16 NLT). Is that any different than today if we go to church for an hour on Sundays and then live like the devil the rest of the time, counting on His grace, without leading and living a repentant lifestyle, without dying daily (1 Corinthians 15:31)? The Apostle Paul says "God forbid" (Romans 6:1-23)! And to you who are troubled rest with us, when the Lord Jesus shall be revealed from heaven with his mighty angels, In flaming fire taking vengeance on them that know not God, and that obey not the gospel of our Lord Jesus Christ (1 Thessalonians 1:7-8).